Fujitsu General has launched its Fujitsu Authorised Partner program – an initiative to provide additional support to an exclusive network of specialist, commercial and wholesaler customers. At a series of forums hosted in major cities from October 26-30, the Fujitsu General senior management team presented the details of the new Fujitsu Authorised Partner platform. 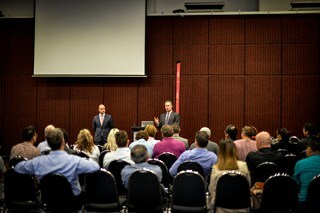 General manager of sales and marketing Dave Smith commented on the initiative at the New South Wales launch in Olympic Park’s Waterview function centre the on October 30: “While Fujitsu General has enjoyed success in the retail category, there are significant opportunities to be leveraged within the Specialist, Wholesale and Commercial space. The program offers accredited partners additional marketing and product support – including resources to help build their businesses – and greater access to corporate hospitality and exclusive incentives. · Cool Finance: an industry-leading finance initiative available from accredited Fujitsu Authorised Partner specialists, eligible consumers who purchase and install a Fujitsu ducted air conditioning system before 31 January 2016 can enjoy 60 months interest free.